Nobody knows for certain how or why the Rows originated as a distinctive town layout system, perhaps unique to Great Yarmouth. They appear to go back to the 11th century, when the sandbanks at the mouth on the River Yare were first settled as a recognisable community of fishermen. The Rows were identified by traditional names, though they were not numbered until 1804, when there were 145. 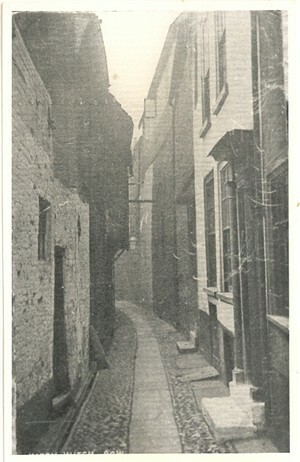 Row names were often taken from notable residents, such as Bayley's Row (no. 97) from Joseph Bayley, a surgeon, or Harnmer's Row (no. 80) from Robert Harnmer, bailiff, or Peacock's Row (no. 142) from a public house of that name. Inevitably, names tended to change, leading to some confusion. Perhaps the best known was Kittiwitches Row (no. 95) which was also the narrowest, being just 30 ins. (0.9 m.) at its western end. This may originally have gained its name from Kit Witchingham, a 17th century baker who lived here, though there are many other theories about witches and strange happenings in this row. A line of jettied Tudor houses overhung the south side, which, combined with its extreme narrowness, made it always a gloomy place. So what was a Row like, and what were the conditions in these homes? Almost by definition, the Rows were extremely narrow, mostly too narrow for a normal horse cart to pass down. (The solution to this was the 'Trollcart', which was specially constructed to be narrow enough to pass through most of the rows, and after which the 'Trollcart' Public House has been named.) Most Rows were paved with beach pebbles, which made them hard to walk on. A few were paved with flagstones and carts were banned from these to make them safer for pedestrians. Moves to clear the worst of the Rows began in 1936, but had made little progress by the outbreak of war in 1939. In the end it was German bombing raids, notably in 1941, which did much of the work, destroying or damaging beyond repair large areas of the old town. In the 1950s, local planners continued where the Luftwaffe had left off, and most of the remaining buildings were cleared to make way for new housing and shopping developments. The destruction of the Rows - however desirable on health grounds - met with some resistance at the time from many residents. This page was added by Richard Dade on 26/01/2007. my grandmother owned a house in one of the rows which the council placed a compulsory order on just before the 2nd world war. I still have all the correspondence relating to the purchase. Thank you for the picture of 116 above - my great, great,great grandparents lived there.It was good to see where they lived. My mother was one of 10 chrildren brought up in row 22, Barnes Row. She has nothing but fond memories of living there, but it must have been a terrible struggle for my grandparents, God bless them. In 1939 they were rehoused in Newtown where I grew up. it is so good to see a picture of the Rows. My great grandparents and my grandmother lived in no 39 the Rows its great to see the sort of place she lived in as a girl. My father lived in one of the Rows as a child with his parents sister and brother. I think it was Row 13 which I have been told is near the Market Place. Any information - I would be grateful. My Great Grandmother (Florence Balls nee Hough, from Sheffield) and Grandfather Edgar Balls are listed as living at No 4, Row 119 in the 1911 census. I think the entrance of Row 119 still exists. I was born 29.07.1925 in Row 3 at my grandfathers house no 17, and started at Rampart Road School in 1930. My grandfather and then my father owned the selbourne house/hotel, which I believe was beside Row 65 or 56.. Fond memories. I live in Australia and would like to know more about the Rows (my Hawkins family came from Row 123 in the 1830s). Can anyone suggest where can I find more information, either online or in printed form? Thanks, Cathy. I was born at no17 Row 3 on the 29 July 1925, which was my grandmother's house. Ii gave the wrong no. of the rows my grandmother lived in with my great grandmother and greatgrandfatherand also her brother I said they lived in 39 the rows but they lived in 139 the rows their names were Alice and William Calthorpe my great grandperents, their daughter Laura (my gradmother)and there son William, any information would be greatly recieved. My grandfather, then my father owned the Selbourne House, which stood on what is now the car park at the back of Palmers. (This was) compulsery purchased around 1969 by the council then knocked down. The Selbourne House was a hotel with bar and food being served. It didn`t have a good reputation as it was used by women of the night. Having said that the bar was quite busy and a lot of sailors from around the globe used it for a good drinking session. Lots of local people still remember the hotel, some with good memories and laugh about what went on behind closed doors after hours, as I do. My husband's maternal Hackney and Linaker families lived in various places in Gt. Yarmouth, including Rows 45 and 137, North Quay and Cobholm Island. Would love to connect with any that are still living in the area and to know more of the living conditions there in the late 1800s. According to my 2 x Gt Grandfathers marriage certificate, he was living on Row 96 at the time of his marriage 1852. Would love to know if there is a way to find out who he was living with around this time as he isn't listed on any census papers and there is a blank space on his marriage certificate for fathers name. Any feedback would be great. Regards. I only recently discovered the existence of the ROWS on a short break a couple of weeks ago. The Time and Tide museum is a must for authentic information. An ABSOLUTE must is a small art museum opposite Time and Tide in the old town walls. This is a small display of the resident artist's work, behind which is the most fantastic museum and workshops built inside an old herring smoke house. Ernie, the artist, potter and proprietor is a delightful character and mine of information.Shipwreck timbers, up to 500 years old, all retrieved from the sea bed play an important role in the fabric of this fascinating place. This really must not be missed!! My great grandmother lived at row 128 with her parents when she married my great grandfather in 1852, he lived on King St. Her brother, Horace or Uncle was murdered there in 1934. They never found out who did it. I hope I can find the Rows when I visit in May of 2012. My grandmother and her family lived in row 125 in 1901 which was also known as Gun Row. She lived there as a girl with her mother and father plus one sister and seven brothers. Does anyone have any pictures or information on this row, many thanks. I was born in Row 128 (number 5) 1st June 1929. I have clear memories of a tiny living room, small scullery and minute backyard which just had room for a mangle. I now live in Somerset. I was born at no.6 Row 133. According to my late Mum Peggy Cozens (nee Olley) it was bombed whilst we were in an air raid shelter. I do not have any more information but would be pleased with any. Glad to see that more people are interested in the subject of the rows. My Great Grandparents Walter Edgar Moy & Nellie Emma Hewitt lived in Row 117 No 18 in 1911, then in Row 99 No 19 in 1912 and in Row 125 No 19 in 1916. They were not well off financially and did not seem to stay anywhere for too long. I live in Australia and am fascinated by the Rows. I would love to visit one day. If anyone has any information on these rows or photos I am really interested. With reference to my earlier comment about no 6 row 133 where I was born, the date was 12th October '39. I would love to hear from anyone with information of the destruction by bombing. My gt, gt Grandfather was ChristmasDay Godfrey, a sailmaker, who lived at no 12 Row 128 with his wife, Hannah, a shoe binder. My gt Grandmother Emma was born there. They moved to no 10 Row 97. They had a blind son, William Christmas Godfrey who married Sarah and moved from No 27 Row 28 to 26 George Street where they had a cobbler's shop. ChristmasDay worked as a sailmaker until he died in the workhouse as a widower in 1894. Any further information on this would be appreciated. We are hoping to visit the Rows shortly to see if we can find where they lived. My mother was born in 1923 in I think Row 118. Her name was Duffield, any info would be great. My dad was born in one of the Rows in 1907. His father is described as an organ grinder on my dad's birth certificate. I imagine life was extremely hard in those days, large families crammed into tiny dwellings in narrow alleyways. My dad left in search of work as soon as he was old enough. Does anyone know of Gooch Row or Gooch Square in Great Yarmouth? My mother was born there, her mother was Tilly Germany then. My mum was born in 1933; she was brought up on Gooch Row/Square in Great Yarmouth. Her Mother Tilly (Matilda) Germany at that time, then married name Sutton. I would like to know if anyone living remembers them at all. Her mother Tilly had 17 children; there are only 2 children alive today. Have just found this page on the Rows. I was born at No. 16 Row 102 in 1937. The Brunswick Hotel was at the top North East side of the row, opposite on the South East side was Freres Public House, where my mother worked. At the bottom of the row adjoining Middlegate Street, was Docwras Sweet Factory on then North West side, on the South West side was Johnson Factory which was next door to our house. I remember having to get out of the house with my mother (my father was on duty as a fireman) when Johnsons was hit by an incendiary bomb, we went up the row to escape but Freres was also hit by an incendiary bomb, just thinking about it I can still feel the heat from the fire as we squeezed past Freres. We were lucky to get out and were taken down another row to my uncle's house in Middlegate Street, he was John High the billposter, I can remember seeing the Tolhouse alight and several fires in Middlegate Street. My gt gt grandfather died at no 6 Says Corner, which looks as though it was part of the 'Rows'. His name was Thomas Atkins. I think the house was his daughter's Sarah Overill. Where exactly is Say's Corner as I am visiting at the weekend! My husbands ancestors, the Blyths, lived in Row 39 in the 1860s and Row 51, No 3 in 1881. Very interesting! Will add this link to his tree. My great, great grandad Thomas Riches lived in row 99; he married Sarah Page. The row is only half there now. As I am now doing my family tree with help from a relative at Norwich I now have information on my mothers mother ( grand mother to me ) Annie Amelia George. She married my grand father Arthur Albert Browne 1906 & lived in row number one (I would like to know where number one was ). 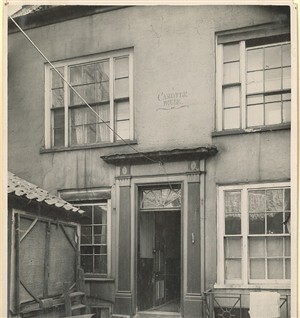 Later in life after his wife died my grand father moved to cobham onto a row which was next to Palmers shop. When Jarrolds shop was bombed in 1940's his house was damaged so he moved further down the row across Howard street to number three. I remember at the top was the Qaker meeting house. My grandfather finished his days there and died in 1949. Last year I visited Yarmouth, went down what was left of the row at the bottom of Howard street to a safety grill to stop people stepping out on to the road and across the road where my grand fathers house was is now a carparking area for the kitchen of a hotel but at least there is a plaque on the wall where the qaker house was. Ah well, life must go on but thanks to the people who runs this site he will not be forgotten. Bellamy the Butchers Row. Can anyone confirm this please. found this on flikr "Great Yarmouth Row 110 has the names New Prison Row or Prison Row. The south side of this row was used for French prisoners of war in the early 19th century. It's also been known as Perry the Oatmeal Maker’s Row or Bellamy the Butcher’s Row. This view looks west from King Street." I have just read that that someones ancestors are the Blyth family. I am also a Blyth whos relatives lived in the Rows. According to my family tree the Algar family lived in 2nd row 119 for over 100 years. My Grandmother is a Blyth and her Great Grandfather and his family were living at Row 51 in 1861, I have recently been looking into her family tree so would be interested to see if we are related to any other Blyths that have commented. My Grandmother is 102 and remembers visiting the Rows as a child. I've just seen the comment of Susan Cook (28/01/2011) about Row 139. I have a postcard from 1911 looking down Row 139. Just read a comment about Caister Road Workhouse. I spent ages looking for 150a Caister Road! Which I eventually found out to be the asylum/workhouse. A distant relative of mine, born 1813 lived at Row 80 number 5 in 1891. He was John Neal DEXTER a cabinet Maker. His previous address included Row 100, Barrows? Walls 11 Amos(iss) Buildings, St Nicholas Road. His first wife was Ann Johnson and second Elizabeth Pope. I need to do more research but any comments happily received. The postcard used in this article, Row 116, shows my grandparents, William and Beatrice Dugdale with one of their sons Brian, my uncle, whom is still alive and kicking as is his brother Duggie Dugdale, my father who is 85 and living with his wife in Caster on sea. Amazing ?? My mother Edna May Harrold (nee' Munford) was born in a house in Row 100. Her father was an air raid warden and she remembers as a teenager helping her father to deal with the incendiary bombs using dustbin lids and sand to limit the damage to the surrounding buildings and properties.Edna was one of eight children born at this location, all now deceased. Many tales were told regarding life as a child in the rows such as tying door handles together on opposite sides of the row and retreating to a safe distance after knocking on both doors. No 3 Row N36 according to 1891 Census was occupied by William Ingram a tailor and his wife Mary Ann Ingram ( Nee Mary Anne west-Alabaster) Alabaster families lived in the rows. Any information or connections would be appreciated. 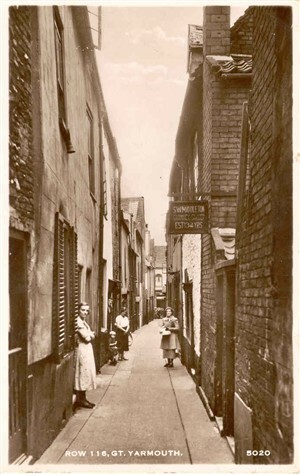 Great Yarmouth Preservation Trust are embarking on a new project to celebrate the fantastic history of the Rows. We are holding a community workshop this Wednesday 16th August 11-1 in St George's Theatre to introduce the project and to collect memories and photos from anyone who has a connection to the Rows. Please email me if you are unable to come but would like to share anything. When my mother died (Mildred May Savage) I discovered a great many photographs including one of my great grandmother standing outside her house No12 on Rowe 34. Her name was Phoebe Thrower married to Jim Thrower. I would love to know about the Rows and see any documents or images if anyone has any! What other names did they used to have? My aunt Pauline Jeffery was born no. 12 Kitty Witches Row on 13/03/1932. My great-grandfather lived in Row 137 and my great-grandmother in 138. I have family who lived in Row 31. Does anyone have any pictures of this row?